If you need vision correction, contact lenses are an excellent solution and effective alternative to eyeglasses and LASIK. Thanks to modern materials and technology, virtually anyone can qualify for contact lenses, whether you have myopia, hyperopia, or an astigmatism. Contact lenses can even be purely cosmetic. Our team of doctors at Southwest Eye Care and Laser in Bakersfield, CA, offer a wide range of contact lenses to address our patients' individual needs, including soft lenses, rigid gas permeable lenses, and progressive soft lenses. Contact lenses can bring the world into focus. For your health, you should only purchase contact lenses under the supervision of an experienced doctor who can determine the appropriate prescription and design. At Southwest Eye Care and Laser, our doctors can take into account your vision, lifestyle, and personal preferences when recommending contact lenses. Most patients choose to undergo their contact lenses exam at the same time as their eyeglasses exam to save time and money. We have a variety of lenses available, including soft lenses and toric lenses. Traditional soft lenses are made from hydrogels, which are gel-like plastics. Our doctors offer the most advanced soft lenses, which are made from silicone hydrogel. This material allows more oxygen to pass through the lens than regular soft contacts. Wafer-thin soft contacts can conform to the surface of the eye, making them one of the most comfortable options. They can be either reusable or disposable. For your health, you should only purchase contact lenses under the supervision of an experienced doctor. While conventional contact lenses can be used for an extended period, disposable lenses are discarded after a short amount of time. This can range from a day to two weeks. Reusable lenses can build up protein, calcium, and lipid deposits from consistent use. As disposable lenses are changed more frequently, these deposits do not accumulate to the same degree. 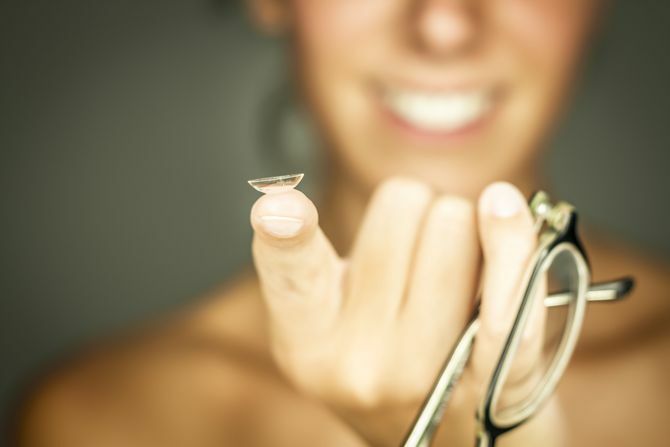 As a result, disposable lenses are considered a healthier, more comfortable choice. In the past, patients with an astigmatism were not good candidates for contact lenses. Now, astigmatism can be effectively addressed with toric lenses. This type of lens can correct astigmatism in combination with nearsightedness or farsightedness. RGP lenses are the most advanced form of hard contact lenses. They are more flexible than traditional hard lenses and allow oxygen to pass to the cornea. These often provide sharper vision than soft contacts, especially for patients with astigmatism. However, they tend to be less comfortable than soft lenses. For patients who have refractive errors in combination with age-related vision decline known as presbyopia, bifocal lenses provide an effective solution. Bifocal lenses can be made from soft lens material or RGP materials, and they may be disposable or reusable. There are various types of cosmetic contact lenses that can help you enhance the natural shade of your eyes or change their color entirely. As with any other contact lenses, these should always be prescribed by a doctor and should never be shared with others. In order to protect the health of your eyes, you should be committed to a daily maintenance routine for your new contacts. Poor hygiene can increase your risk of infection and conjunctivitis. In addition, long fingernails can damage soft contacts and scratch your eyes. Unless cleared by your doctor, you should not sleep with your contacts, as this can damage your cornea. Always wear your contact lenses as prescribed and replace them with new lenses as directed. Contact lenses can help you see more clearly, so you can enjoy life freely. To schedule a contact lens fitting and learn more about the benefits of contact lenses, reach out to one of our doctors today. You can contact us online or call our office at (661) 393-2331.